Bird Sanctuary. A Hospital, Rehab Facility and Last Resort Home for Injured Birds. One day last week I was driving south along the beach and decided to make a stop at a bird sanctuary. A Ranger at our park, who is also a bird rescuer, had told me about this bird hospital/rehabilitation center and “last resort” home for injured birds. She had recently taken a Barn Owl fledgling there from our park to be nursed back to health and rehabilitated until it could manage in the wild on its own. 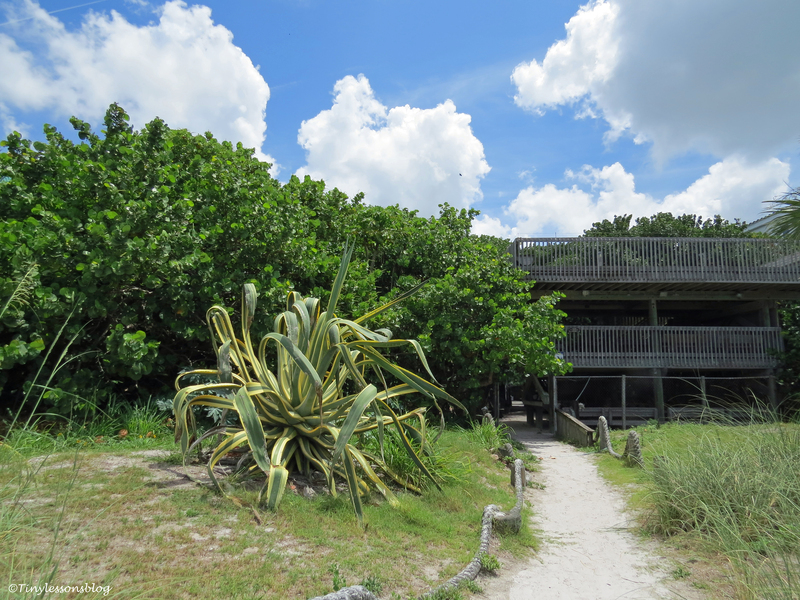 This sanctuary sits right on the beach in a beautiful setting with lots of tall trees and tropical plants. I was surprised to see many healthy birds also hanging around on the beach and in the gardens on the sanctuary grounds. I saw Great Egrets, Snowy Egrets, Black Skimmers, Great Blue Herons, Black-crowned Night Herons, Brown Pelicans, and Black Vultures. Maybe they had friends or family living in this home, or maybe they just felt safe there with other birds. The sanctuary has a bird hospital, a building where the injured “patients” brought here for care and rehabilitation are housed. Most of those birds would heal, be rehabilitated and then released back to the wild. And therefore should not get too accustomed to people – no visits allowed. The birds are brought here with many kinds of injuries, most common being injuries to the wings, legs, bill or eyes. Many caused by close contact with human operated machines, such as boat propellers. If their injuries are so bad that they will not be able to manage in the wild although otherwise healed, they have a home here for life. 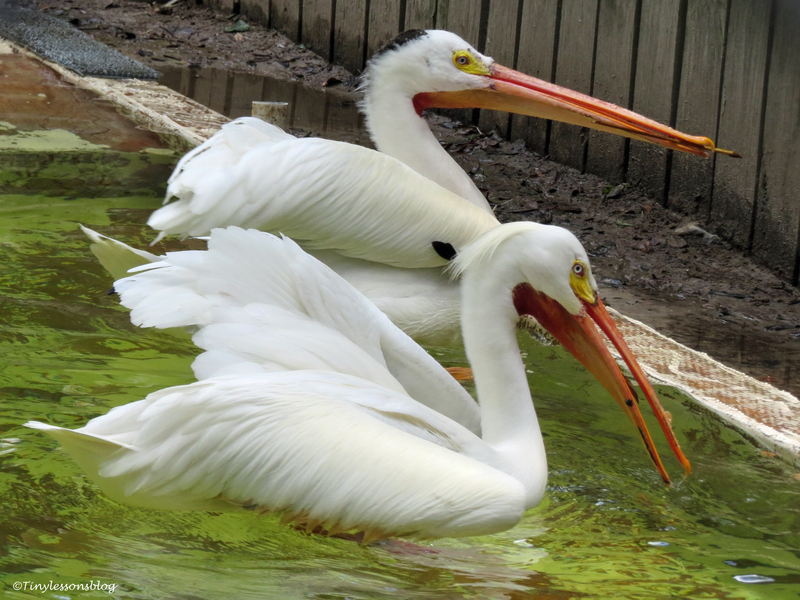 Like these White Pelicans. Many of them seemed to be quite happy and playful despite their permanent injuries. Some were playing with sticks, others were swimming, and yet others were incubating eggs. The babies born here will be released back into the wild when they are ready to leave their parents, and have been trained to manage independently. But I have to tell you the story of two Blue Jays. They share a little apartment here, just the two of them. They have no external injuries. But they had been raised by humans as pets, and then just left on their own – to die. They are now adults, but have no idea how to live in the wild. One of them (below) would meow like a cat. I’m not kidding. They have been trained, but it’s clear they will never be able to live in the wild. They don’t know how to get food. They have also left the sanctuary twice by themselves, but returned “home” both times. I don’t want to put in print what I think of people who take wild baby birds as pets, and then just abandon them. The majority of the permanent residents are seabirds: pelicans, gulls and different kinds of herons and egrets, but there are also a few owls and hawks. 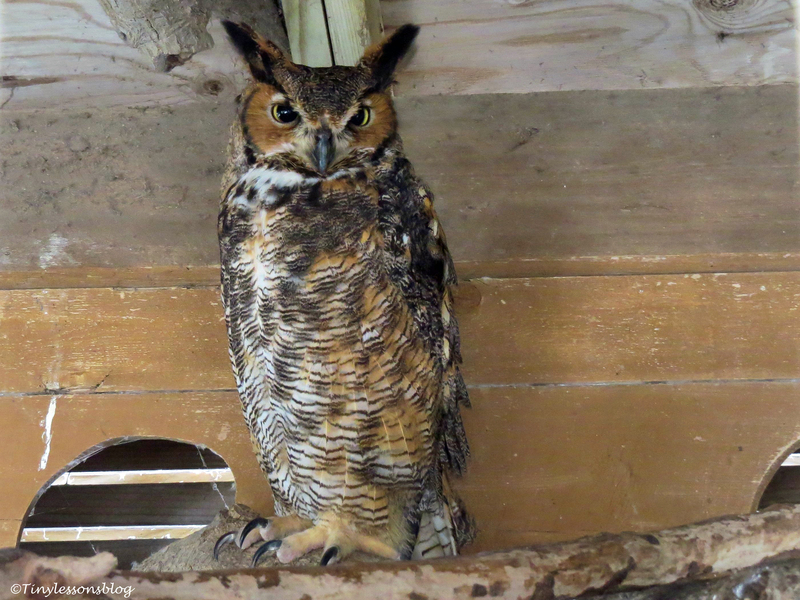 This beautiful Great Horned Owl has a wing injury and is no longer able to fly. I’m happy there’s a place where injured birds from a quite wide area are taken care of, and that most of them are actually rehabilitated back into life in the wild. Thanks for coming along and have a great day. Previous PostEmpty Fridge. Life Lessons. And Romantic News from the Salt Marsh.Next PostTimeout. Fresh Deliveries. And Beauty in the Salt Marsh. Thank for your kind words, Tom. Happy you enjoyed the story. I rescued two parrots, Zoro who knows every Sci Fi sound and many words, ( he watches NCIS, and Fox News on TV 🙂 and listens to country music…he feeds my dogs I have rescued over the years his food, he loves to share with them, when one of them passed away ( Tank, his best friend he used to ride on his back ) he was so quiet for over two weeks….he’s slowly jabbering again…. It is indeed wonderful that we have these organizations and compassionate staff/volunteers taking care of “all life”, as you say, when they need a helping hand. I was so happy to see that the birds who could not be released back to the wild were not apathetic, but instead quite active and playful. ❤ and best wishes! I’m glad you wrote this post about the sanctuary.I visited a similar one in Florida for raptors, but I wish somebody was available to explain to us about the raptors that were kept there. I was lucky to have a volunteer explain the stories of many of the “permanent residents”. 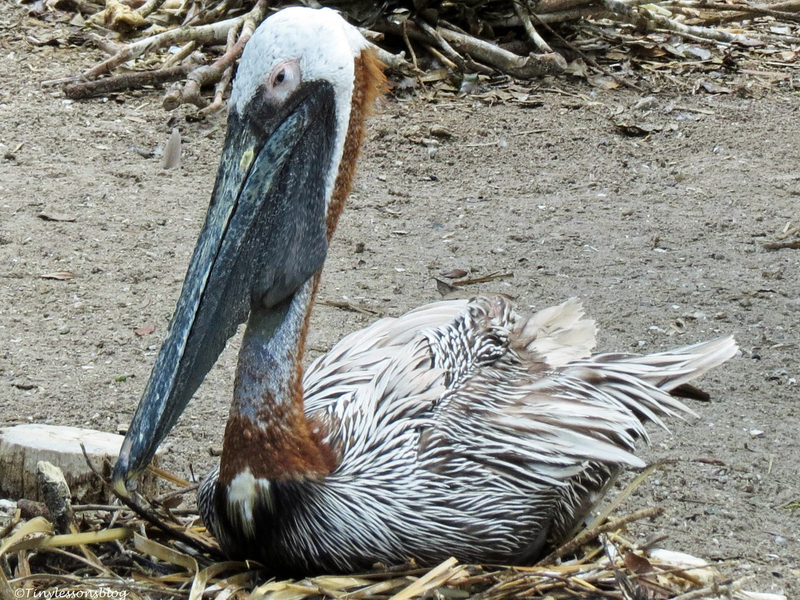 I might go back there when all the pelican babies have hatched…one had hatched already, but was so far away and surrounded by mom, dad and other well wishers, that I didn’t get a good picture. Florida would certainly be the place i would visit in the US if I came there! What you have shown me so far is wonderful, I love your passion for your natural heritage and the conservation of it. So wonderful to live so close to such great wildlife. Thanks again Tiny! So satisfying to know there are such places. Yes it is. When the little Barn Owl was found in our park, it was good to know there was a place for him until he could live on his own, a great safety net. I love sanctuaries. It’s so nice to see people take care of wild living creatures then let them go live a life they are supposed to live. I love the pictures as always, my friend. I was all GRRR too when I heard the story of the Blue Jays. But I’m happy they seemed okay and lively, they really don’t know of anything else than what they have now, a much bigger “apartment” than the cage they were raised in. And I’m happy most birds heal and can go back to their lives. Thanks Jackie! Glad you had a chance to see some of the permanent residents at play. Animals face so many obstacles from humans, nature, and predators. It’s wonderful to see them survive and thrive.. Absolutely. We almost hunted them to extinction for their plumage! We are hoping to visit a rehab facility too on our trip, for the owls mainly for Boeta. Similar stories, birds not knowing they are birds and injured birds. They use the unreleased as education birds for schools. This place also has an educational program for children with their “permanent residents”. But I don’t think I can ever see a Blue Jay without thinking of these two who didn’t know they were birds. Sounds like a treasure, that bird hospital and rehabilitation centre – we have a few on Vancouver Island as well. I would enjoy working at such a place! It was lovely to see so many birds were given a home. And that even many more birds get the care they need and can go back to their lives. They seem to have a few staff and many volunteers there…must be very satisfying work! What an interesting place, you tell the story of it well and the photographs are excellent. Thanks Susan, happy you enjoyed the visit. Thanks Sharon! I was happy to find so many birds just chilling in the trees and walking in the garden and on the beach nearby, in addition to seeing the many birds who’d gotten their permanent home here. Hugs to Helsinki too! The good thing was that I could see the birds who were no longer able to live in the wild, still quite well adapted to their current life in care of the humans. 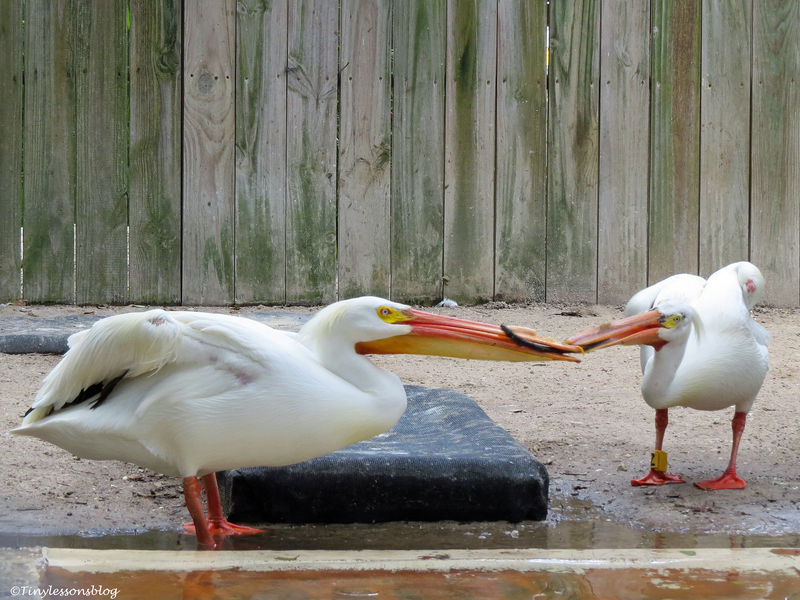 One of the pelicans for example, was not even able to pick up a fish due to the injury to his bill, but when given a fish directly in his bill, he was able to eat it. And he was otherwise a very playful and active bird. Health is indeed a treasure! Love the quote. The sanctuary seems like a wonderful place. And they do amazing work! Yes, they do amazing work! The satisfaction in seeing birds able to return to their normal life is their greatest reward. What a great opportunity to hear about the wonderful work they are doing at that Bird Sanctuary. I love stories like this with big heart! Really great photos, too, Tiny! Thanks Cyndi. The staff and many volunteers there really have a big heart and do wonderful work for the birds! I love bird and animal rehab sanctuaries. We have a wonderful raptor center here. It’s heartwarming to see the animals that have been rescued and such a privilege to be able to see them up close. It is, indeed, heartwarming to see places like that. There was a Red-tailed Hawk rescued as a badly injured juvenile…he was 33 now, the oldest bird in the sanctuary. 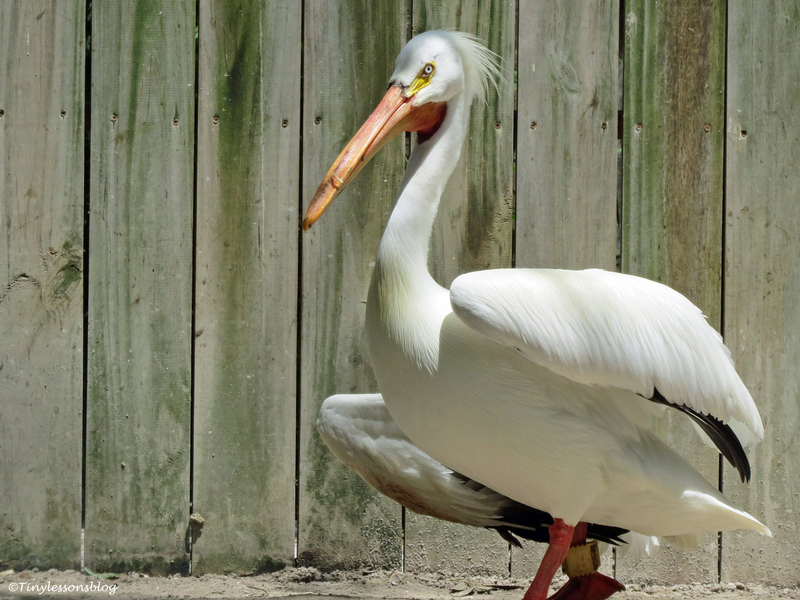 He alone had provided many opportunities for us humans to see such a wonderful bird up close, including many kids participating in their educational programs. It warms my heart that such a place exists. A true sanctuary in every sense. 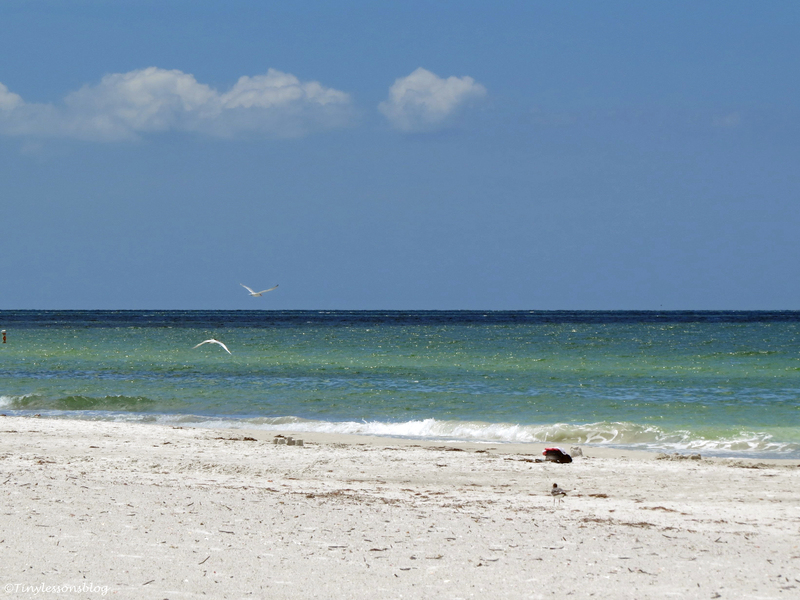 We have quite many sanctuaries here in the region, including for dolphins and sea turtles. It is wonderful there’s a place where injured wildlife can get the care and rehabilitation they need to return to their lives. And those who can’t, will get a home. Magnificent. Makes me happy, too. He was a wing amputee, such a beautiful bird. Thanks and happy you came along, Jet. What a very special place. I’m so glad a place like this sanctuary exists to take care of the injured and maimed. How very sad about the blue jays! They are one of my favorite birds. How could someone raise them as pets and then just let them go to die?? People are just so….. well, never mind. I am continually saddened by mans inability to be good stewards of the earth and nature. Thank you for taking us along on another lovely excursion and giving us a glimpse into the sanctuary! I was so sad for the lovely blue jays as well. Now when I see one in the wild, my thoughts always go to these two. Luckily they have a nice home now – they don’t know of anything else so they seemed happy. Glad you came along for the tour, Amy. Sometimes I wonder if there is something wrong with me because I have far more compassion for animals than I do people. Probably because people create many of their own difficulties and animals are too often at the mercy (or lack thereof) of mankind.